Turbidity targets were established by the EPA, SJRWMD, and SFWMD. The EPA targets for turbidity were not specific for the IRL and required a good understanding of “natural conditions,” which isn’t available for the IRL, particularly for the different sublagoons. After a comparison of the criteria from each source, it was decided that a combination of the established targets would be used in the Indian River Lagoon Ecological Health Assessment. 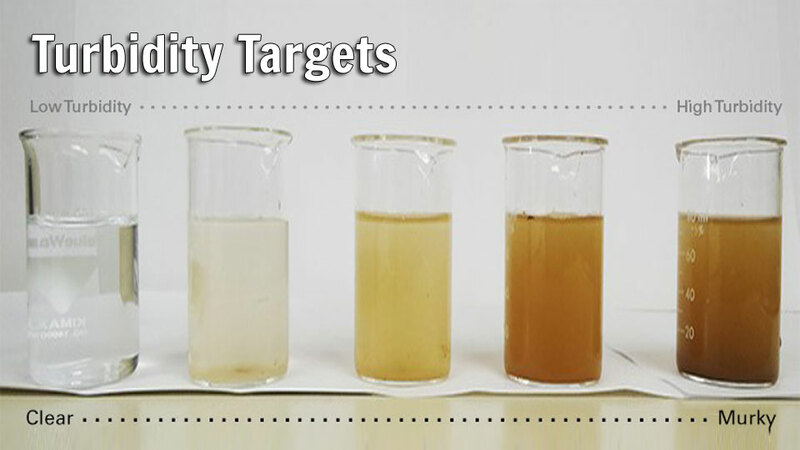 The SFWMD target is to be used for the SIRL and the SJRWMD targets for the BRL, CIRL, and NIRL. The use of the EPA targets was not chosen as the current background conditions for turbidity are unknown throughout the IRL. Similar to other parameters, SJRWMD had a target for the North and South subsections of the CIRL and these were used as-is by separating our sampling sites by subregion. Additionally, it must be noted that to date no known target has been established for the ML. As a result, an in-house target was derived from the target of the closest sublagoon areas, BRL and NIRL, in which the annual median shall not exceed 4 NTU.